Posted November 28, 2018 by Mitch Hitch & filed under Featured Inner West Independent, Inner West Independent. Inner West residents learned for the first time last week that the WestConnex Stage 3 tunnel between Haberfield and St Peters would be less than 20 metres under some of their homes. NSW Planning approved the project in April with only an ‘indicative route’. Since then residents have been waiting for a map. The final route chosen by Stage 3 contractor Lendlease is different from the one in the Environmental Impact Statement (EIS). According to the EIS. the tunnel was supposed to cross under King Street Newtown but the new route stays on the western side. Leichhardt residents who escaped a dive site bullet, now find that they’ll be far more affected by tunnelling than anticipated. While most parts of the tunnel will be over 25 metres under homes, some residents in Stanmore, Annandale and St Peters learned that the shocking news the tunnel stubs could be as little as 13 metres under their homes. Since WestConnex began in 2013, the LNP government has banked on planning the project is stages which keeps the cumulative impacts hidden. But as the human and property costs of the first tunnels escalate, this strategy is failing. This was demonstrated last week when Labor’s Transport shadow minister Jodi McKay successfully managed to focus media attention on appalling damage to hundreds of homeowners along the M4 construction route. Last Sunday, Strathfield resident and experienced construction worker Umberto Galasso spoke at a public meeting convened by the NSW Greens on the North Shore, where residents are increasingly opposed to the Western Harbour Tunnel and Beaches Link. 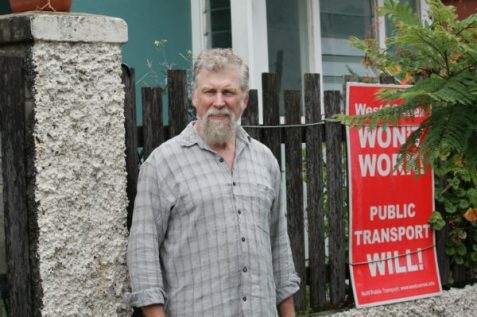 They were alarmed by his warning that his home could collapse unless WestConnex immediately repairs the damage it caused. City Hub has spoken to Kingsgrove, Tempe and Haberfield residents whose claims that their homes have sustained damage have been rejected by contractors. This includes Kathy Calman who told the NSW Inquiry into the Impacts of WestConnex that RMS refused to accept that serious cracks to her home were caused by WestConnex, even though they appeared shortly after construction adjacent to her home. Facing the costly prospect of legal action, Ms Calman was forced to cancel work leave despite undergoing treatment for breast cancer. Jodi McKay is demanding that Stage 3 M4/M5 approval conditions should be applied to residents affected by earlier stages but her confidence in the Stage 3 conditions is not shared by residents dreading vibration and settlement impacts. The Stage 3 conditions provide that before work that could cause damage begins, WestConnex must establish an ‘independent property assessment panel’ to resolve disputes about damage. This is an extra step that earlier contractors do not have to go through. But given that Westconnex would be selecting ‘independent’ experts for NSW Department of Planning and Environment approval, some residents and community groups aren’t at all impressed. One of these is St Peters resident John Bartholomew, a public artist and carpenter who faces 7 years of construction, only to be left with a ventilation stack and the massive St Peters Interchange, both only 150 metres away and a tunnel less than 20 metres under his home. Mr Bartholomew is scathing about the possibility that residents would trust a process managed by WestConnex. Since 2015, he has repeatedly asked at dozens of information and EIS sessions, how deep the tunnel will be under his house. He has never received a clear answer. The results of geotechnical studies in his street are secret. “They don’t know what they’re doing and don’t care because they know if there ’s a disaster it’ll happen to someone else, not them. The only people who’ll benefit will be major contractors and tollway owner Transurban. They don’t listen to experts and they just hope for the best.” He predicts more serious damage in St Peters if shallow tunnelling is allowed. With construction on the mainline tunnels not due to begin until mid-2019, Inner West Greens MPs Jenny Leong and Jamie Parker are still calling on the government to “stop this deeply flawed project and stop more damage to the homes and lives of people living along the route. “Depths of between 16-25 metres under many residential streets …are extremely worrying given the severe impacts we’ve already seen on homes in other areas at deeper tunnelling depths,” Ms Leong said. WestConnex’s new CEO Andrew Head and NSW RMS CEO Ken Kenofski both refused to answer questions from the Parliamentary Inquiry about the value of the Stage 3a M4/M5 mainline contract, on the grounds that the Rozelle interchange Stage 3b contract is not yet signed. Asked to provide an indication of how much it would cost to cancel Stage 3, Mr Head simply said ‘billions.’ How many billions is a key question. An environmental disaster which independent experts argue will not solve traffic congestion demands more of a response than a ramped up condition or even a costly Royal Commission, which Labor has also flagged. Labor was initially opposed to Stage 3 WestConnex but then Leader of the Opposition Luke Foley ignored thousands of letters calling on him to affirm that position. One of his last acts as Opposition Leader was to announce a transport policy that did not oppose any part of WestConnex. But it’s not beyond the bounds of possibility that faced with liability for the cost of the yet-to-be designed Rozelle Interchange, the need for find billions more required for the Sydney Gateway and other massive roadworks made necessary by WestConnex, and ongoing conflict over damage that contractors refuse to fix, Labor could rethink. It might still consider the possibility of negotiating its way out of Stage 3 if elected in March 2019. This is made slightly more likely by the fact that Lendlease engineering division, which won the Stage 3a contract in June, is in trouble. It will not relish a protracted struggle with residents and constant complaints about Westconnex. In September, WestConnex applied to the Department of Planning and Environment (DPE) for significant changes to the project approval that were required on Lendlease’s advice. The Inner West Council, WestConnex Action Group and residents all vigorously objected to yet another four years of additional impacts in Haberfield and St Peters. This week, the DPE posted a notice stating that it required more information from WestConnex. This means that WestConnex’s response to objections has not been accepted which could cause further delays. “As part of the Department’s rigorous assessment, we have asked the applicant to confirm information in relation to traffic movements, parking and noise issues. Once this advice is received the Department will continue to assess the modification of this major project on its merits,” a DPE spokesperson told City Hub. It could be that DPE’s somewhat bruising appearance before the WestConnex Parliamentary Inquiry into impacts of WestConnex is encouraging a more cautious approach. This delay will not be good news for Lendlease that recently released a statement to the stock exchange to explain losses in its engineering division. This is the division which has incurred blow-outs of $350 million in its construction of Transurban’s tunnel Northconnex and two other Queensland projects. Lendlease has flagged a review of the engineering division and has even raised the possibility of selling it altogether. It will be very aware that CPB ( owned by CIMIC) contractors have been unable to control costs on Stage 2 New M5 construction and made a loss on the M4 widening. At the Annual General Meeting, Lendlease CEO Steve McCann told shareholders that the group had lost its appetite for risk. Stage 3 WestConnex carries lots of risks for Lendlease and delays could lead to more nervousness about the Stage 3a contract. Nothing is certain about Stage 3, including its contractor, which is why Transurban warned investors of the political risks when it took over the project.